2.1 Locality 1 [NM 485 637]. 2.2 Locality 2 [NM 481 641]. 2.3 Locality 3 [NM 479 643]. 2.4 Locality 4 [NM 480 647]. 3.2 Locality 5 [NM 463 638]. 3.3 Locality 6 [NM 462 638]. 3.4 Locality 7 [NM 462 641]. 3.5 Locality 8 [NM 464 641]. 3.6 Locality 9 [NM 465 642]. 3.7 Locality 10 [NM 466 643]. 3.8 Locality 11 [NM 464 643]. 3.9 Locality 12 [NM 457 639]. 3.10 Locality 13 [NM 457 642]. 3.11 Locality 14 [NM 457 643]. 3.12 Locality 15 [NM 456 645]. 3.13 Locality 16 [NM 457 649]. 3.14 Locality 17 [NM 454 647]. 3.15 Locality 18 [NM 452 654]. 3.16 Locality 19 [NM 452 656]. 3.17 Locality 20 [NM 451 658]. 3.18 Locality 21 [NM 457 663). 3.19 Locality 22 [NM 459 663]. The objectives of this excursion are to examine around Kilchoan the effects of thermal alteration both in the host rocks and the included xenoliths of the hypersthene-gabbro of Centre 2, and to observe the relative age relationships and form of the plutonic intrusions of Centre 2 between Beinn na Seilg and Aodann. The internal structure of the hypersthene-gabbro and its contact with the granophyric quartz-dolerite are well displayed on the southern and eastern slopes of Beinn na Seilg, while the relationships between the eucrite of Beinn nan Ord and the quartz­gabbros of Beinn na Seilg, Garbh-dhail and Faskadale (Centre 3) are seen on the northern and western slopes. Cone-sheets of the inner suite of Centre 2 cut the quartz­gabbro of Garbh-dhail, and the contact of this ring dyke with the older gabbro of Lochan an Aodainn can be observed. The composite nature of the quartz-gabbro of Aodann is also well displayed. A late felsite is seen cutting the Aodann quartz-gabbro, and a pitchstone dyke cuts the hypersthene-gabbro. Total distance (Kilchoan-Kilchoan) about 17 km, including car travel. From the Kilchoan Hotel follow the main road westwards for about 300 m. Vehicles may be parked near the post office. Locality 1 [NM 485 637]. Just beyond the War Memorial, a small roadside exposure reveals amygdaloidal basalt. Although not suitable for collecting material, it is possible to observe that some thermal alteration has occurred, from the presence of a grey weathering product (as opposed to the normal rusty weathering of unaltered basalt). This is probably produced by the hypersthene-gabbro which is some 400 m to the north. A cone-sheet which cuts the basalt sill shows its dark, fine-grained margin. Locality 2 [NM 481 641]. Continue west along the main road, turn right for the lighthouse and proceed as far as the Free Church, where vehicles may be parked. In small exposures above the road, just to the south of the Free Church manse, the cone-sheets can be seen to still possess their dark margins although lying close to the hypersthene-gabbro. The Lower Lias shales which form the host to the cone-sheets are. however. considerably indurated. Locality 3 [NM 479 643]. Further north, immediately beyond the last house on the right of the road. recrystallised cone­sheets with a new growth of biotite are exposed cutting altered basalts, the amygdales in the basalts being filled with chlorite or plagioclase feldspar. Unaltered porphyritic cone-sheets with well-chilled margins are also present. These may be either part of the inner suite of Centre 2 or part of the Centre 3 suite. Locality 4 [NM 480 647]. Follow the lighthouse road north to the junction for Sanna. Turn right and proceed as far as the permanent caravan site, just before reaching the bridge over the Amhainn Chro Bheinn. Limited parking is possible on the left of the road by the bridge. Joining the road by the entrance to the caravan site is a grassy track. Follow this track, which eventually gives way to a footpath, upstream for about 400 m, until a heavily hammered area on the path is reached. Black xenoliths in which dark green spinel, basic plagioclase, colourless corundum and sapphire occur, are found here as irregular shaped or rounded masses enclosed in a grey, completely recrystallised basic rock. This dark-grey rock is possibly an early consolidated part of the hypersthene-gabbro. A narrow, banded reaction zone, usually only a few centimetres wide, is developed between the sapphire-bearing masses and the grey rock. Normal hypersthene-gabbro occurs a few metres to the north of this locality, while the basalt of Glebe Hill which forms a roof to the gabbro, lies immediately to the south. Return to the junction of the Sanna road with the Lighthouse road and turn right. Continue along the road for about 1.5 km to a point near the southern end of Lochan na Crannaig, where vehicles may be parked in a lay-by on the left of the road. Head south-westwards across country for about 500 m. using the slightly higher ground to skirt to the north-west of a large area of peat, then south-south­east for a further 400 m to the gorge of the Alit Fhearghais (not named on coloured map). Follow the stream southwards for about 700 m to the col between Beinn na Seilg and Stacan Dubha, and thence to the Lochain Ghleann Locha. Proceed to the western end of the strip of land separating the lochs, to examine relationships between the hypersthene-gabbro, basalt and a pitchstone dyke. Locality 5 [NM 463 638]. The outer contact of the hypersthene­gabbro passes between the lochs. lying in a hollow. bounded to the south by basalt. Judging by the topographic relationships. the contact dips fairly steeply. Cutting the hypersthene-gabbro is a north-north-west trending pitch­stone dyke. This is fairly well exposed near the western end of the south shore of the northern loch, the outcrop displaying the flow-banding characteristic of this particular intrusion. Locality 6 [NM 462 638]. Immediately west of the twin lochs, outcrops of basalt and hypersthene-gabbro occur in close proximity. Again the evidence suggests a steeply dipping contact. In this general area both the hypersthene-gabbro and the basalt are cut by cone-sheets of the outer suite of Centre 2. Locality 7 [NM 462 641]. The col separating Beinn na Seilg and Stacan Dubha has a central ridge of higher ground, with a gully (occupied by the Alit Fhearghais) to the east, and a more gentle depression to the west (this lies due north of the western end of the twin lochs). Head northwards to this depression. Near the highest point of the col, on its western flank, are several outcrops of the pitchstone dyke. Most of these show magnificent examples of contorted flow­banding. Nearby, in the centre of the col depression, dyke­like bodies of fine-grained basic rock are present in the hypersthene-gabbro. Locality 8 [NM 464 641]. Skirt around to the south of the ridge of ground east of the col depression and cross the floor of the gully to Stacan Dubha. On the south-west hillside, over­looking the twin lochs, numerous xenolithic bands occur within the hypersthene-gabbro. The bands reach up to 1 m or so across, and keep a constant width for several metres before dying out. They usually dip northwards at about 25°, lying parallel to a mineralogical layering which is developed in the surrounding gabbro. Lithologically, they are dark grey, fine-grained basic rocks, and close in composition to the hypersthene-gabbro itself. Both the xenoliths and surrounding gabbro are cut by a system of acid veins. Locality 9 [NM 465 642]. Just a few metres north of the summit cairns of Stacan Dubha, steeply dipping dyke-like bodies of fine-grained basic rock usually only a few centimetres, but reaching up to 1 m thick, are found to extend through the hypersthene-gabbro for several metres. Some of these appear to have been intruded into the gabbro while the host was still hot, but others are definitely xenolithic. Locality 10 [NM 466 643]. Lying about 150 m north-east of the summit of Stacan Dubha is a marked north-north-west to south-south-east trending gully. North of this gully a number of gabbro-pegmatite bodies occur sporadically within the hypersthene-gabbro. Some of these pegmatites have associated cores of quartz-feldspar rock. Locality 11 [NM 464 643]. Follow the north side of the hill westwards to the crags which overlie the gully of the Alit Fhearghais, and form the north-western flank of the hill. A granophyre sheet is found here intruding the hypersthene­gabbro. This is probably. a marginal extension of the granophyric quartz-dolerite which outcrops further west. Locality 12 [NM 457 639]. Return to the south-west side of Stacan Dubha and then head westwards, along the contour to the south slope of Beinn na Seilg. Ascend Beinn na Seilg noting that the outcrops en route show the presence of a complex contact between the hypersthene-gabbro and the granophyric quartz-dolerite. On the higher part of the mountain this contact is flat-lying, the hypersthene-gabbro clearly forming a capping. Southwards too, the sinuosity of the contact and the occurrence of isolated patches of gabbro surrounded by granophyric dolerite show that the hypersthene-gabbro overlies the granophyric dolerite but their contact here must dip southwards at about the same general angle as the topographic slope. Individual contacts. where visible, however, dip both to the north and the south. the northerly dip possibly being produced by the attitude of the layering in the hypersthene-gabbro controlling marginal off-shoots from the upper surface of the granophyric dolerite. Both intrusions are cut by cone-sheets of the inner suite of Centre 2. Locality 13 [NM 457 642]. Cross the summit ridge of Beinn na Seilg between the cairns and ascend the western summit. A magnificent view is afforded of the Inner Hebridean islands, with the Outer Hebrides being visible on a clear day. Locality 14 [NM 457 643]. Descend from the summit ridge to an area of level ground lying north of the western summit. At this point the quartz-gabbro of Beinn na Seilg shows evidence that an olivine-gabbro of eucritic affinities has been profoundly affected by the later intrusion of a granophyric magma, resulting in the production of a quartz-feldspar mesostasis and alteration of the olivine and pyroxene. The granophyric component contains small apatite crystals. The boundary with the granophyric quartz-dolerite appears to dip steeply. Locality 15 [NM 456 645]. Continue northwards to the floor of the col separating the western and northern summits and cross to the western flank of the the mountain. The eucrite of Beinn nan Ord, which outcrops as distinctive ice­rounded, rusty-brown masses, has steeply dipping contacts with both the quartz-gabbros of Beinn na Seilg and Garbh­dhail. A view north-westwards to Beinn nan Ord shows the eucrite clearly extending up through 100 m or so of altitude. The northern summit of Beinn na Seilg is formed by a dyke-like arm of eucrite, with a near-vertical lateral contact against the quartz-gabbro of Garbh-dhail seen just north of the point where the arm leaves the main mass. More or less unbroken outcrops in this area show the arm to be continuous with the ring dyke. Near its contact with the eucrite, the quartz-gabbro of Garbh-dhail becomes rather fine-grained, more basic and brecciated. Locality 16 [NM 457 649]. Return to the col and follow the eastern flank of the northern summit ridge northwards. Here the quartz-gabbro of Garbh-dhail, cut by members of the inner cone-sheet suite of Centre 2 and the arm of eucrite, forms the roof of the quartz-gabbro of Faskadale (Centre 3). The edge of this younger intrusion is marked by a metamorphic zone in the older rocks, which forms a positive topographic feature that extends down the hillside. The top of the intrusion, immediately below this roof, is composed of granophyre, but further downhill the granophyre becomes more basic and grades into a rather acid quartz-gabbro which, in turn, passes into normal quartz-gabbro. Locality 17 [NM 454 647]. From below the eucrite crags of the northern summit ridge of Beinn na Seilg head south­westwards toward the marked fault-controlled valley of Struthan Bhraigh nam Allt which extends north-south along the west flank of the mountain. In the gorge cut by this stream, steeply dipping porphyritic dolerite cone­sheets cut the quartz-gabbro of Garbh-dhail. Xenoliths of fine-grained basic rock occur in the quartz-gabbro, and acid veins traverse both the xenoliths and the gabbro. These veins also cut the cone-sheets. Locally, the quartz­gabbro passes into olivine-bearing gabbro. Locality 18 [NM 452 654]. Follow the valley north for about 500 m to a peat-filled loch basin and then turn north-west for a further 200 m to the hillside on the north-east margin of Garbh-dhail. This hillside forms the southern end of a craggy north-south ridge which lies to the west of Struthan Bhraigh nam Allt. In this area a steep junction between the quartz-gabbro of Garbh-dhail and the older gabbro of Lochan an Aodainn is visible. the quartz-gabbro showing marginal chilling. The older gabbro is characterised by a distinctive black or bluish-black colour on weathered faces. which results from the presence of dark. clouded feldspars. Although the rock has the composition of an olivine-gabbro it often shows coarsely crystalline spots of acid material and granophyre veins. It also contains xenoliths of fine­grained material of quartz-dolerite affinities which in places form sheet-like bands. Looking south to the northern summit of Beinn na Seilg, the arm of eucrite can be clearly seen cutting through the quartz-gabbro of Garbh-dhail with a vertical contact. Locality 19 [NM 452 656]. Continue northwards along the ridge until basalt forming the inner margin of the older gabbro is found. To the east the basalt gives way to agglomerate. the fragments in which are similar to those in the vents of Centre 1, and consist of basalt. trachyte, tuff and quartz­dolerite. All fragments in the agglomerate show the effects of thermal alteration brought about by the adjacent plutonic intrusions. The basalt is similarly metamorphosed. but retains its major structures. Locality 20 [NM 451 658]. Return to the summit of the ridge and continue north to the crags at its termination, where a small felsite intrusion outcrops. It is a dark-grey, non­porphyritic rock, which on its eastern flank cuts the quanz­gabbro of Aodann. Although younger than the plutonic intrusions which are close by, the rock shows signs of thermal alteration, possibly indicating the presence of the Faskadale quartz-gabbro at no great depth below surface. The quartz-gabbro of Aodann, which occurs near the contact, is relatively fine-grained, but contains porphyritic feldspar crystals up to 5 mm long. Locality 21 [NM 457 663). Head eastwards to cross the Struthan Bhraigh nam Allt, and a parallel stream about 100 m further east, and then turn north to the craggy hill that separates Lochan an Aodainn (a loch with a beautiful crescent of waterlilies) from Aodann. In this area the quartz-gabbro of Aodann exhibits an extremely variable texture and composition. A fine-grained facies forms the capping of the hill, but downhill a coarse-grained variety is found. An abrupt change between the two types occurs on the northern and southern slopes of the hill, but on the west the change appears gradational. Two separate phases of emplacement may be present, the fine-grained facies representing the earlier injection. Also. 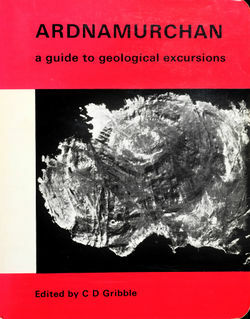 about 250 m east of Aodann at the contact between the coarse and fine­grained types. a finely crystalline dark-grey rock, banded with coarser lighter coloured material, is found, which may represent the remains of an even earlier, more basic, phase of intrusion. Occasionally within the gabbro xenolithic strips occur, with patches of fine-grained rock of quartz­dolerite affinities. Locality 22 [NM 459 663]. From the summit of the hill head eastwards to a point about 75 m south-west of the Kilchoan-Lighthouse road and 500 m east of Aodann. Here the outer margin of the quartz-gabbro of Aodann forms a rocky feature extending westwards somewhat obliquely to the hillside. Lying topographically below this feature, the Great Eucrite of Centre 3 is seen displaying a typical coarse-grained appearance. Along the contact between these two rock types occurs a fine-grained porphyritic quartz­gabbro. This may represent either another facies of the Aodann quartz-gabbro or an early phase of the Great Eucrite. The junction with the Great Eucrite dips at about 70° to the south-west. This page was last modified on 14 December 2015, at 00:33.